The fleece is shingled and nuno felted to create a haphazard variation of the two colors. 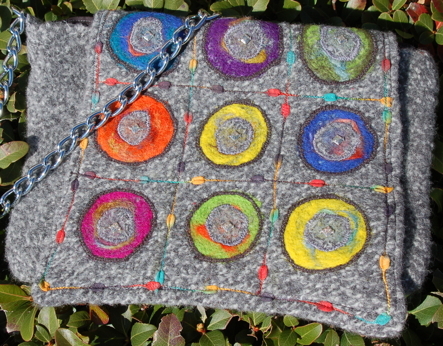 The rug yarn is machine felted to add a design feature at the seams. At the recent Durham Orange Quilt Show, I met the owner of Empty Pockets Alpaca Farm near Greensboro, NC. She had admired the gray felted bag I had available for sale in the boutique, but someone else had purchased it too quickly. So she handed me a couple of bags of fleece and a ball of rug yarn, asking me to try my hand with designing a bag of similar style using the alpaca fleece. She wants an outdoorsy style, with some bright colors and beading incorporated. She liked the chain style strap. So “off my wall” this Friday is the almost completed bag. 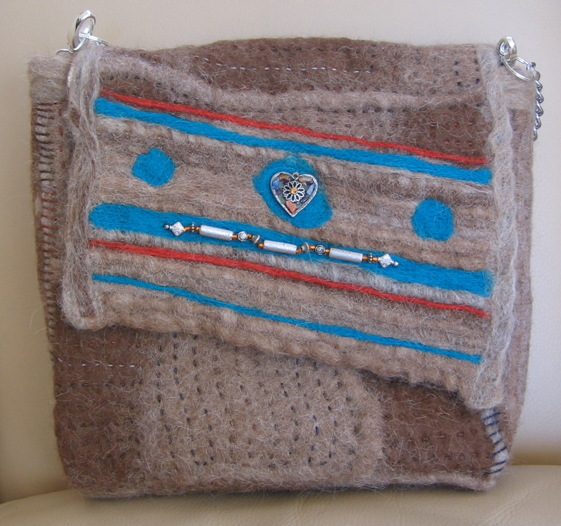 All that remains is the addition of the center third of the strap, felted for comfort over the shoulder. The side view shows the ladder stitch of variegated wool yarn used to emphasize the cording that emphasizes the edges of the gussets. Sachiko stitches add texture and help to hold the fuzziness at bay. 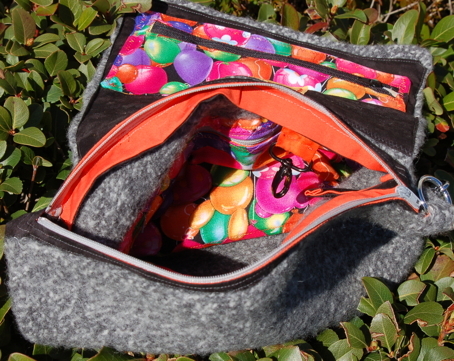 A colorful batik fabric lining holds one felted pocket and one fabric pocket. There is a key fob also. On deck, is a second bag of an entirely different style of the same soft alpaca for Empty Pockets Alpaca Farm. Perhaps that will make it to the wall next Friday. Meanwhile, be sure to check out Off The Wall Fridays to see what others have been working on lately!! This entry was posted in Copyright© 2009 All images and text in all categories are copyright of Mary A. Ritter (aka M'Unique) and may not be reproduced without express permission., Fiber Arts and tagged 'M Unique, alpaca, art ELEMENTS, Empty Pockets, sachiko, SAFF, Trails Bag. Bookmark the permalink. 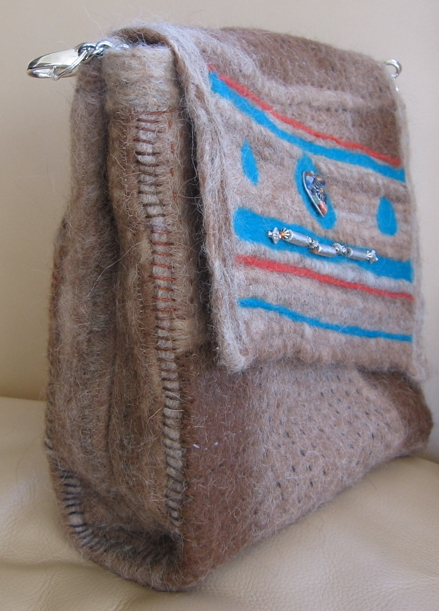 Lovely bag, and having handled alpaca myself, I know it will be soft and cuddly and just plain better! ohhh just want to say that my daughter says that everything is better in alpaca!! 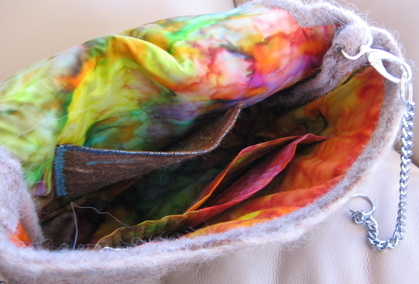 We have a farmer here who is using the fur in quilt batts and on silk scarves – these are so wonderful! Nice bag! Love the inclusion of a key fob! Thanks for the comment on my blog too!